'S e prìomh-bhaile nan Stàitean Aonaichte a th' ann an Washington, D.C. Chaidh Washington D.C. a stèidheachadh a dh'aona gnothach gu bhith na phrìomh bhaile. 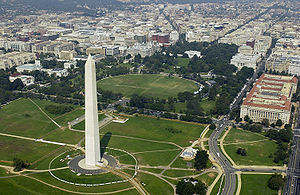 Tha na litrichean D.C. a' seasamh airson District of Columbia. Tha sin a' ciallachadh gur e siorrachd àraidh an Riaghaltais Fheadarail 's chan e stàite a th' ann an District of Columbia. Tha na trì roinnean an riaghaltais, an Riaghaltas fhèin, na cùirtean, agus a' Còmhdhail, stèidhte ann an Washington, D.C. Tha 601,723 duine a' fuireach an seo. Chaidh an District of Columbia stèidheachadh fo Bhun-reachd nan Stàitean Aonaichte ann an 1790. Chaidh e a roinneadh bho Virginia agus Maryland. An toiseach 's e dùthaich cheàrnagach a bh' ann an District of Columbia le 10 mìle air gach taobh, rud a rinn 100 mìle cheàrnagach air fad a bh' air gach taobh na h-aithne Potomac. 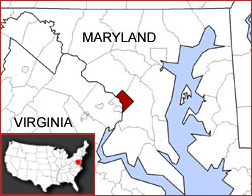 Ann an 1847, chaidh am pàirt a bhuineadh do Virginia bho thùs a thoirt air ais do Virginia. Mar sin, tha an District of Columbia gu lèir air an taobh a tuath na h-aithne Potomac. Chan eil an District of Columbia na stàite mar Virginia neo Maryland agus air sgàth sin, chan eil an District air a riochdachadh anns an t-Seanaid neo anns an Taigh nan Riochdairean. Agus cha do ghabh an District pàirt anns na iomairtean-taigh a' cheann-suidhe gu ruige 1961 nuair a chaidh an 23mh atharrachadh a' Bun-reachd a chuir an sàs. Bho sin a-mach, tha còir aig an District of Columbia pàirt a ghabhail annta le tha trì bhòtaidhean aice. Samuel L. Jackson: (1948). Actair. Tha na Channeled scablands, roinn gheo-eòlach inntinneach, suidhichte ann an Washington, D.C.
Air a tharraing à "https://gd.wikipedia.org/w/index.php?title=Washington,_D.C.&oldid=542060"
Chaidh an duilleag seo a dheasachadh 3 dhen Chèitean 2018 aig 07:07 turas mu dheireadh.